The AV Club quite liked this. That was fun. I wasn't all that into the opening scene with the foreskin talk, but the car chase won me over. I also like the running debate Jesse and Tulip are having about how and why to use Genesis, and that he respects her enough to talk it out instead of just making her go along with whatever he thinks best. The preacher with the cage about killed me too, especially when it was clear it was over social media. "Covered cage works best is why." 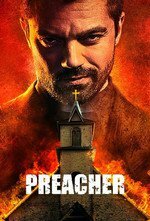 So Preacher, the comic, is kind of a huge formative influence for me, and I binged the entire first season yesterday. I liked it well enough, but I don't think Jesse really clicked for me up until the last episode, but this! Oh man, this was everything I wanted. The car chase, the carpool karaoke, Cassidy's bit with the umbrella, "mace your balls," all of it was pitch perfect. Gross and funny with just the right amount of heart. I don't seem to recall Mike being in the books, but he fit right in. I'm so into this, I'm so glad that they aren't screwing it up. Agreed. I thought I would bust a gut watching the first season, (especially the finale), and the premiere seems on track to be just as much fun. Binging the first two seasons of Mr. Pickles really put me in the right spot for this season opener! It's been a while so I had to watch the last episode of Season 1 again, then straight into 2:1. Yup, following the trend of mindless graphic violence. Loving it. Then episode 2 popped up in the stream and I really had to force myself to stop it there. I need to ration this stuff.